Construction work on two road projects in the Keta Municipal Assembly have stalled due to delayed payment. The bitumen surfacing of the Aflao town roads (old Melcom Lorry Station Street and access road) and Keta Area roads was originally meant to be completed in March 24, 2014 but was later revised to November 15, 2016. In spite of the revision in the completion date line, a field visit to the project site in October this year showed that nothing much had been done. 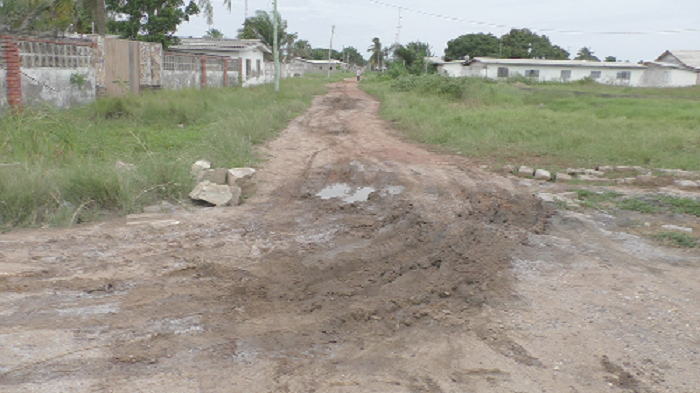 Portions of the Keta area roads, for instance, were flooded with red sand and mud occupying a greater part. The two roads are about 5.75 kilometres in length and were part of a number of projects that the government had allocated oil revenue to. Although the two projects were due to cost GH¢3.1 million as of the time it was awarded in November 2012, due to the delays, the estimated cost to date stands at GH¢5.6 million, while the certified amount paid to date is GH¢3 million. About GH¢545,637, representing 10 per cent of the funding requirement, was sourced from petroleum revenue in 2014 through the roads and other infrastructure allocation in the Annual Budget Funding Amount (ABFA). The Daily Graphic gathered that for a project whose main source of delay had been funding, voting a small portion of oil revenues confirmed the worry of industry players on the thin spreading of the ABFA over the years. As part of a field visit to the project site by the reporter who is part of a training programme aimed at enhancing the role of the media in promoting transparency and accountability in the oil and gas sector, sponsored by the Ghana Oil and Gas for Inclusive Growth (GOGIC), it was revealed that the physical progress of the project is 60 per cent, while financial progress is estimated at 54 per cent. Information made available by the Feeder Roads Department in the Volta Region showed that the contract was awarded to Messrs Otuboat Limited on November 23, 2012 but work commenced on March 28, 2013. The project was initially scheduled to be completed on March 24, 2014 but was later revised to November 15, 2016 due to delayed payments. Work on the 1.45km Old Melcom Lorry Station Street, which is in the Ketu South District, and a 0.3km access road in the same township commenced in March 2013, but as of the time of the visit in October 2017, work had come to a halt due to funding challenges. Work done so far on the road comprised the formation, which included the clearing of unsuitable materials, and preparation of the base for the next phase of the project. The Operations Manager of the Department of Feeder Roads, Volta Region, Mr Edward Asenso, said the contractor currently had chippings piled at the Timber Market in Aflao ready for pre-coating before the final laying of the primer seal. The roads were still in a deplorable state and residents explained that they still had to deal with the issue of perennial flooding. Some of the residents who spoke to the team explained that the last time they saw the contractor on site was in 2013. Since then, no work has been done in spite of several complains to officers at the Keta Municipal Assembly. Mr Asenso, in an interview after a tour of the project, said the major challenge of many road projects had been funding. He said certificates for payment were issued from the Department of Feeder Roads covering the requests made from the contractor, but as to whether they were paid or not by the Ministry of Finance could not be confirmed. He also explained that the contractor, Messrs Otuboat Limited, was trying to raise funds to complete the project because it was becoming deplorable after being left idle for a long while.